Create memories and make learning fun in our classes for your little one! Introducing a brand new curriculum for children ages 6 months to 5 years! Our Spring Session Begins January 30, 2019! This class will center on learning to play musically with your child through bounces, wiggles, tickles, simple songs, and lullabies. 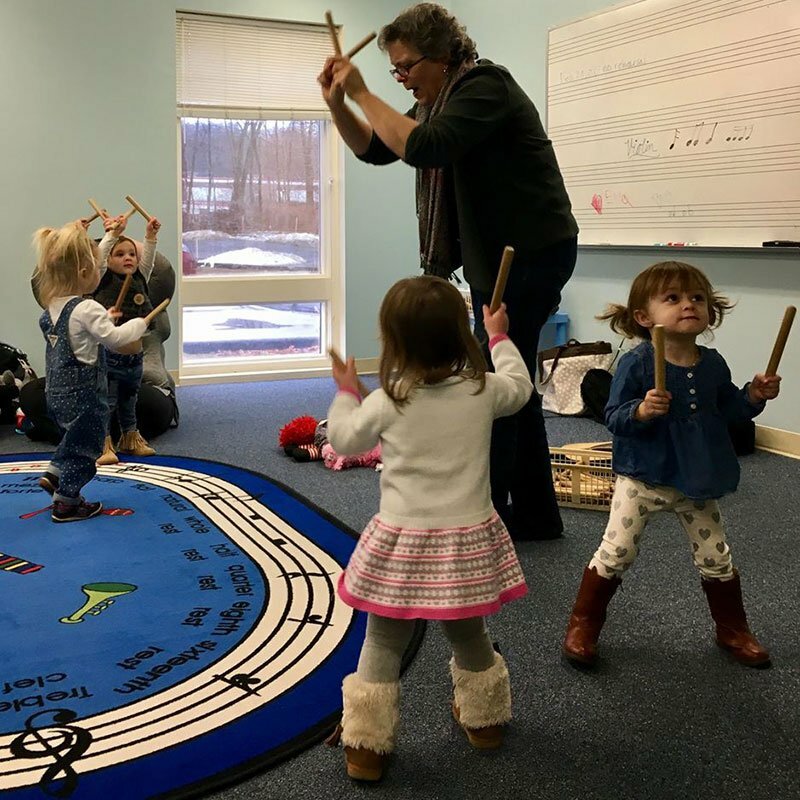 Caregivers and babies will explore simple rhythm instruments and engage in circle games and dances but with plenty of time for “at your own pace” musical exploration and social interaction. Walkers are full of energy and love expressing themselves with their whole bodies! Action songs, games, and dances will be at the center of this class along with opportunities to explore sound by manipulating a wide variety of rhythm instruments and learning to sing simple songs. Two and three-year-olds are ready for a greater variety of movement and song and love to express themselves musically and in dramatic ways. We will begin to make music as a group, learning to interact with others, listen carefully, and follow simple instructions. Fundamental musical concepts of rhythm and pitch will be introduced, and social aspects of music making -playing and dancing as a group, mimicking sound patterns, etc. will be at the center of our class. Thinking about private lessons for your child, but not sure where to start? Try our “Eagles” program (below)! “Eagles” is a part of the CMS “First Notes” curriculum for 4-5 year olds, and is designed to prepare young children to begin private music lessons! Using glockenspiels and recorders, this instrumental group class will focus on pre-note reading skills, listening and self-control using games and group activities. FLOCK ~ The whole family! For whole families that want to make music together, Flock classes center around singing and movement with classic children’s songs, chants, finger-plays, and dances. Stay tuned for our next pop-up class for the whole family! Martha received her B. Mus. Ed degree from Hartt College of Music, studying both violin and viola. She spent the following year studying string quartet literature at the University of Connecticut with the Laurel String Quartet. She is the founder of Goodwin Strings, a before-school group violin instructional program for 2nd and 3rd graders at Goodwin Elementary School in Old Saybrook. She also presents our weekly music program for the collaborative preschool students at Essex Elementary School, teaches First Notes, and is the Director of Kate’s Camp for Kids. Martha is the founder and conductor of CMS Fantastic Fiddlers and CMS String Ensemble orchestra, two groups that bring her immeasurable joy as a frustrated conductor, as well as the Chamber Connections and Violin Karate programs. Martha teaches Monday – Friday.